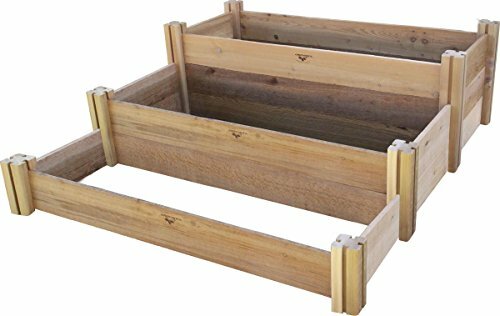 Gronomics Multi-Level Rustic Raised Garden Bed, 48 by 50 by 19'' by Gronomics at Tulips Orchids. MPN: MLRRGB 48-50. Hurry! Limited time offer. Offer valid only while supplies last. Make a dynamic statement with Multilevel Gardening. Our multilevel Raised Beds offer complete control over soil quality and improved soil drainage. Make a dynamic statement with Multilevel Gardening. Our multilevel Raised Beds offer complete control over soil quality and improved soil drainage. Modular raised garden beds easily expand with the gardener's needs. The simplistic design assembles in minutes. The three level design offers soil depths of six, eleven, and fifteen inches. These beds hold 13.4 cubic feet of soil and are ideal for small plots of veggies and/or flowers. You eliminate tilling, soil amending and minimize weeding. Place the beds in an ideal sun location, add soil mix, and plant. Easily adapt square foot gardening techniques to these beds. Modular raised beds make gardening simple and enjoyable. The rough sawn rustic appearance looks great in any setting.